I say "pee-pee" and "poo-poo" way more than I'd care to admit. My vocabulary is lacking quite a bit of sophistication these days. But I would be fibbing if I said I gave a crap...because I don't. And sadly enough, pun is intended. 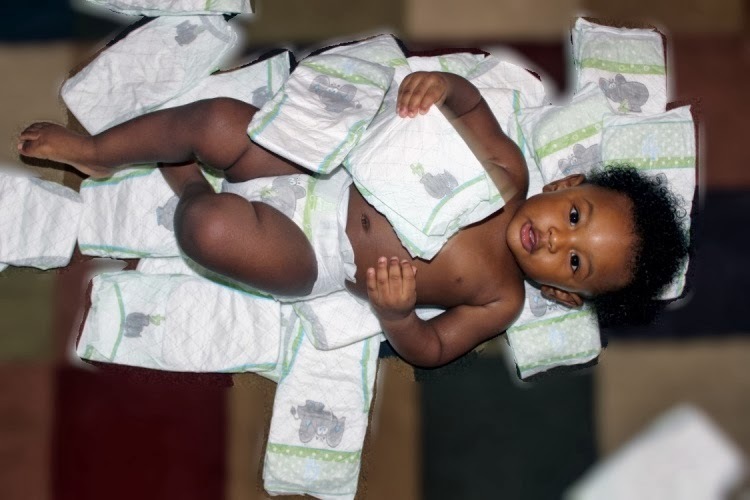 Liam turned these diapers into his own personal blanket. (He just loves to make a mess and bust the packet open, resulting in them going all over the place.) 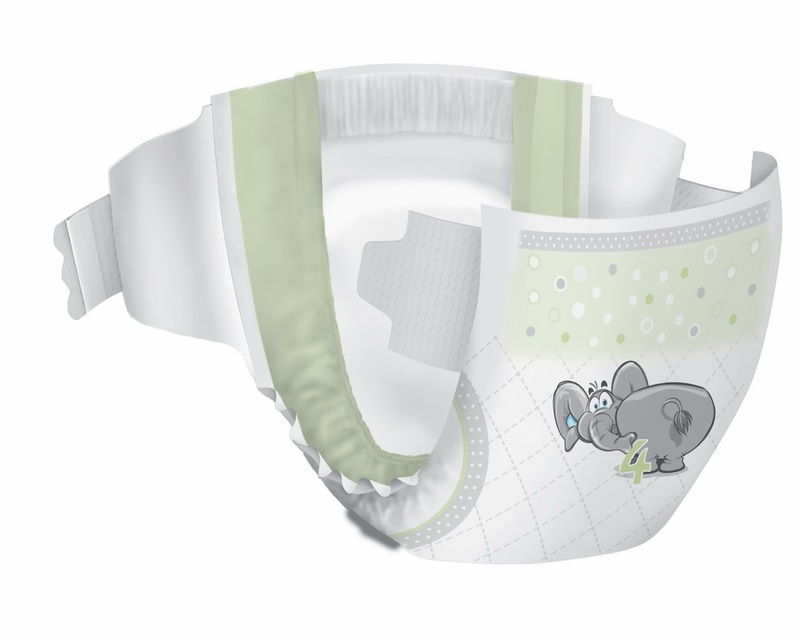 Both the outer and inner coverings of this diaper are soft for baby's skin. The inner liner is even hypoallergenic, with natural botanicals, vitamin E and aloe. Liam just graduated to a size 4 diaper. If it wasn't for his big belly (blame table food on this), he could have stayed in size 3 for awhile. But, he needs a stretchable design that will move with is body and keep him comfortable as he moves. Liam played for awhile, then I laid him down for a nap. I do not like to disrupt him as he is falling asleep, nor do I want to wake him to change a wet/dirty diaper. 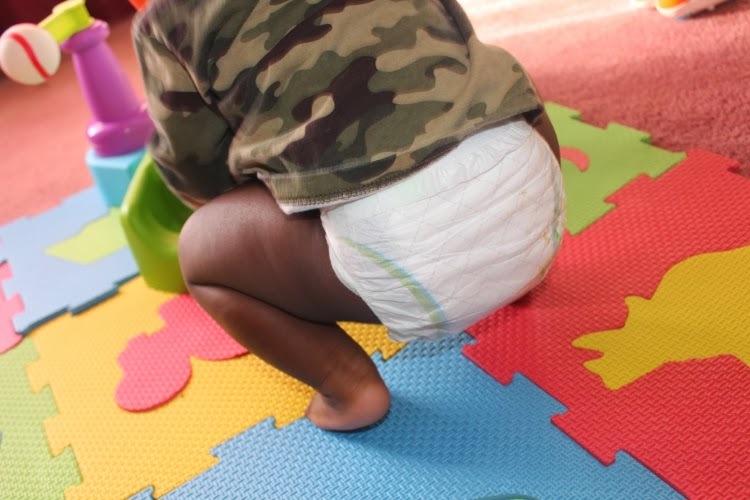 Therefore, it is important that a diaper prevents leakage at any time of the day. 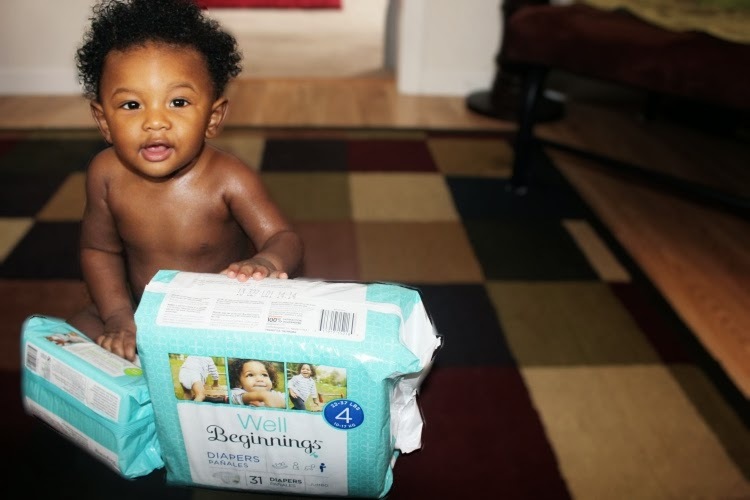 Well Beginnings diapers did just that. He woke up with a wet diaper, but the sheets remained dry. For the rest of the day, Liam was his busy self. He crawled, attempted to take a few steps, fell on his bottom, played with is toys, rolled around on the floor and anything else you can imagine a baby would do in one day. 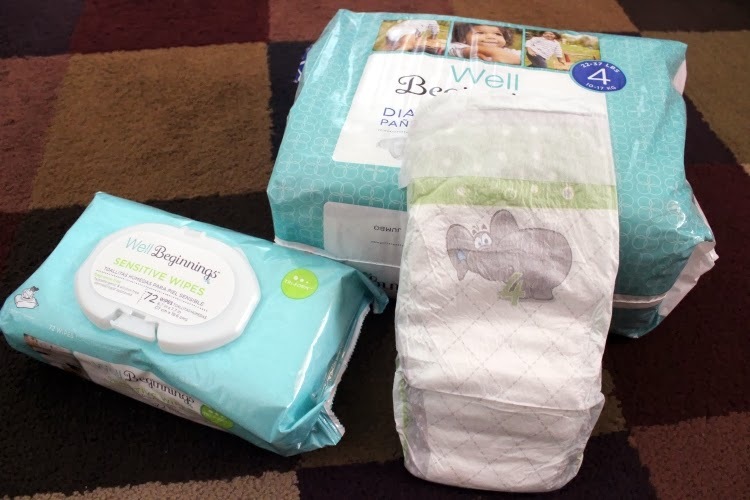 Although Well Beginnings diapers are priced just a tad bit more than other store brand diapers, I can see us using these in the future. They measure up to other brands, offering great quality at an affordable price. I love the elephant design on the front. 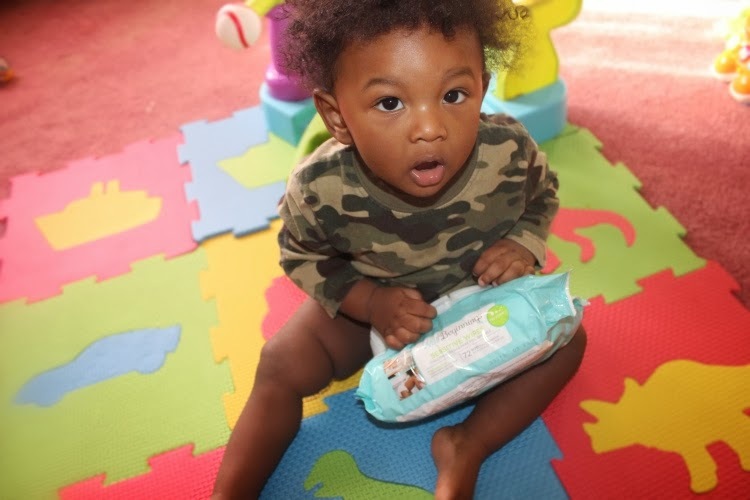 And did I mention that these diapers are made in the USA, because they are?! 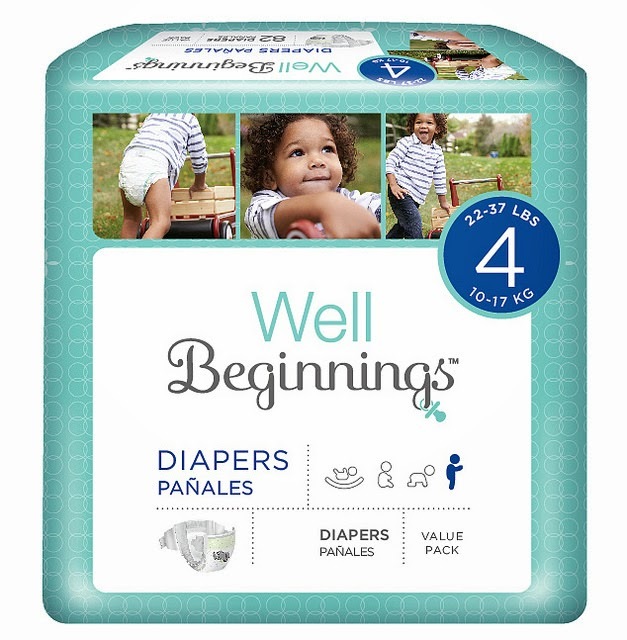 If you are heading to your local Walgreens store, be sure to look for the Well Beginnings products on the shelf. You can't miss the vibrant blue packaging. I love the color. Every parent wants what's best for their baby. Start them off great. Give them Well Beginnings. 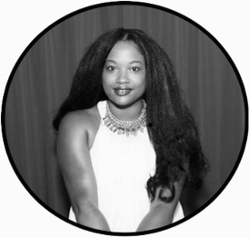 This is a sponsored post written by me on behalf of Well Beginnings. I was sent product to facilitate my review and I was paid for my time. The opinions and views are my own.